One week after Cam Newton’s dabbing led one horrified mother to write a viral scathing letter against the quarterback’s touchdown dance, online celebration police stayed away from their keyboards on Sunday night after Arizona Cardinals kicker Chandler Catanzaro hit the dab against the Cincinnati Bengals. Catanzaro’s last-second 32-yard field goal lifted the Cardinals to a 34-31 home win, so the understated dab was definitely deserved as the team moved to 8-2 on the season. But after the dance, something interesting happened: nothing. No open letters from outraged Cincinnati-area mothers targeting Catanzaro were posted online, and no angry NFL fans took to Twitter to question Catanzaro’s sportsmanship. Perhaps the one letter from a Tennessee mother, which really served as a veiled attack on black American culture, written last week against Cam Newton’s celebratory dabbing dance was enough to sort out everyone’s sensibilities. 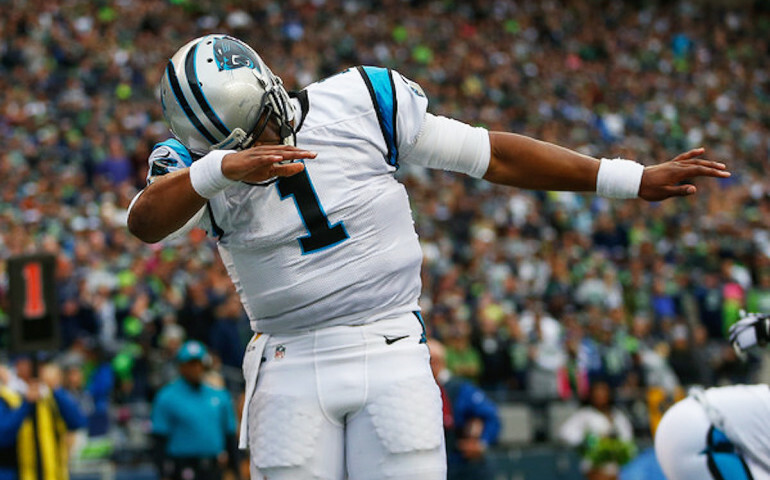 The NFL is a progressive, dab-friendly league now, so let’s keep it that way. Catanzaro wasn’t the only player to dab his way through another NFL Sunday. Dallas Cowboys wide receivers Dez Bryant and Terrence Williams dabbed into each other’s arms after a touchdown against the Miami Dolphins. The Carolina Panthers continued to carry the dab deeper into NFL celebratory tradition Sunday, and yes, nobody got mad! It’s all good now folks — Migos’ Atlanta-based hip-hop move is becoming more infectious with every Panthers touchdown. Running back Mike Tolbert followed Newton’s lead and dabbed on ’em after scoring against Washington during the team’s home 44-16 win. The Panthers remain undefeated at 10-0 on the season, which got head coach Ron Rivera dabbing in the postgame locker room. Earlier this week, Rivera defended his players’ dancing to ESPN, recognizing the value in the theatrical aspect of the game. “It’s not just football anymore. It’s about entertainment, too. These guys are not robots,” he said. Rivera is also not a robot.